In Joh n Ford’s The Searchers, John Wayne’s character, Ethan, reluctantly joins a posse pursuing Comanches that have abducted his niece, Debbie, played by Natalie Wood. There’s a scene where the posse freezes upon hearing the sound of a Comanche signal. Reverend Clayton glares at Ethan; Ethan glares back. Reverend: You wanna quit, Ethan? Ethan: That’ll be the day. What follows is a sort of ghost story. And a complicated one at that. I have an inkling of where it’s going, but I won’t know how it ends until we get there. I was two and a half years into a hateful corporate job and fidgeting around for new creative work. Along with writing and doodling, I was also interested in photography and filmmaking. In late 1986 I wrote to the local PBS station about their “Screenplay Project,” so I could pitch them an idea. I’d never written a screenplay before, but attempted stage plays as a kid. I loved the idea of “making a movie,” but lacked the experience and skills. I knew what I really needed. I needed a story I could disappear into. Previously it was all about “Write what you know,” just as my teachers had instructed. So I wrote about high school and living in my hometown. What, I wondered, would it be like to write about things I didn’t know? How would it feel to become characters whose experiences were entirely different than my own? That’s probably what I’d hoped for in The Dumond Stories. But I was one story in before I realized I was in way over my head, so I stopped cold. By September 1987 I had the idea for a combination teleplay/long-form piece. It would tell the story of an aging and nearly forgotten pop musician named Dean McLeary and his creative muse—the great Buddy Holly. 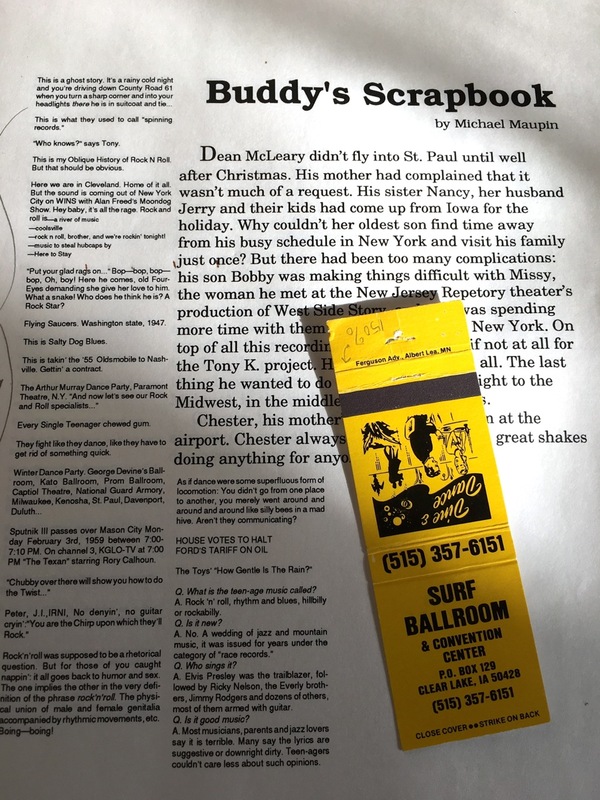 You see, that previous September I made a road trip to the Surf Ballroom in Clear Lake, Iowa, to do research on a story with the working title Buddy’s Scrapbook. The “raw writing” part would not be a script, but a straight-up short story told by the main character, pop musician Dean McLeary, and “embellished” by a “mysterious researcher” named Matt J. Durand. This, I think, is important to the story I want to tell here, chiefly because it was the second time I’d used a pen name; my high school novella The Crowded Room was “written” by its main character, high school senior Jeffrey Dunne. Buddy’s Scrapbook was the first time I’d have one character “annotate” another character’s story. Clearly I was worried about becoming the “self-absorbed, egotistical author type.” I was trying to stay out of the story’s way. 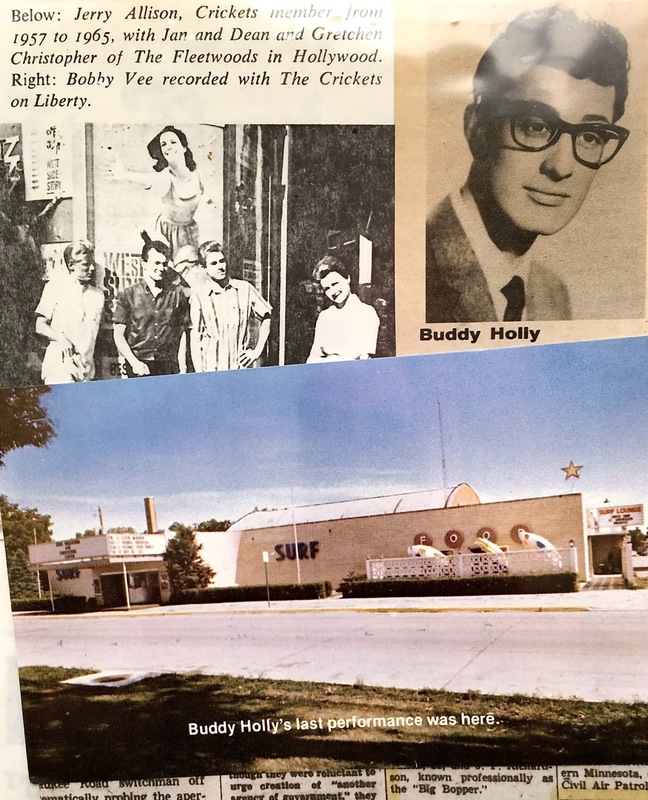 Interposed with Dean’s story (who, by the way, was based on folk singer Don McLean, of “American Pie” fame) is Matt J. Durand’s “Model of a Binary Universe Set to Music” and his hypothesis that Buddy Holly’s life was mysteriously and inextricably linked to Bernstein’s West Side Story. It’s a stretch, but Durand makes a valiant attempt. Meanwhile Dean “arrives in Clear Lake at Nancy and her husband Roger’s house, they have supper, drinks, and conversation around the kitchen table.” Before going to bed, Dean calls his girlfriend Missy in NYC, who’s playing Anybodys in an off-Broadway production of West Side Story. Dean decides to stay longer in Clear Lake and connects with the owner of the Surf Ballroom, where one night he takes the stage to play Holly’s “Well…All Right” to the delight of his sister and others present. Obviously the story’s drama would work itself out “in the details.” I still have a hefty piles of notes, research, and whatnot of a draft … that never materialized. What would I learn from this crazy writing process? And would I ever finish the project? ~ by completelyinthedark on March 24, 2017.